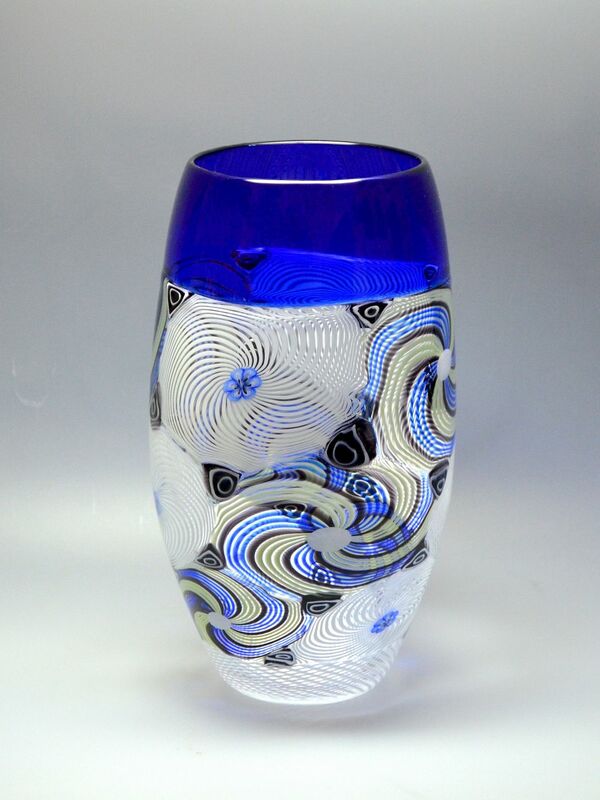 This astounding large vase was made by Michael Hunter for Twists Glass in 2016. It is a very elegant shape that starts with a cobalt blue incalmo top. Sandwiched between the blue in cal on top and the white latticino base is a broad band of large white rondel canes with blue flower murrine centres and blue black and green rondel canes with white rose murrine centres. Closer inspection will reveal that the roundels are laid in a vertical diagonal pattern around the middle section, alternating three white, three coloured, three white and three coloured. The white and coloured roundels are separated by black and white "Swiss roll" murrines. The base is scratch signed "M Hunter Twists 16" and has the Twists Glass studio label. A magnificent vase!